Further, we use the Button type in the NumberPad type to create the calculator buttons. Button.qml specifies the basic properties for a button that we can modify for each button instance in NumberPad.qml. For the digit and separator buttons, we additionally specify the text property using the property alias text that we define in Button.qml. For the operator buttons, we also specify another color (green) using the property alias color and set the operator property to true. We use the operator property in functions that perform the calculations. Some of the buttons also have a dimmable property set, meaning that they can be visually disabled (dimmed) whenever the calculator engine does not accept input from that button. As an example, the button for square root operator is dimmed for negative values. We use the Display type to display calculations. In Display.qml, we use images to make the display component look like a slip of paper that contains a grip. Users can drag the grip to move the display from left to right. Unlike other QML animation types, AnimationController is not driven by internal timers but by explicitly setting its progress property to a value between 0.0 and 1.0. Inside the AnimationController, we run two NumberAnimation instances in parallel to move the number pad and the display components simultaneously to the opposite sides of the view. In addition, we run a SequentialAnimation instance to scale the number pad during the transition, giving the animation some depth. We use the easing curve of the type Easing.InOutQuad to accelerate the motion until halfway and then decelerate it. In Button.qml, the text colors of the number pad buttons are also animated. We use Qt.darker() to darken the color when the button is dimmed, and Qt.lighter() to light up the button when pressed. The latter is done in a separate state called "pressed", which activates when the pressed property of the button's MouseArea is set. The color changes are animated by defining a Behavior on the color property. This way, when a button is pressed, all buttons on the NumPad receive a buttonPressed signal and are activated or deactivated according to the state of the calculator engine. When users press a digit, the text from the digit appears on the display. When they press an operator, the appropriate calculation is performed, and the result can be displayed using the equals (=) operator. 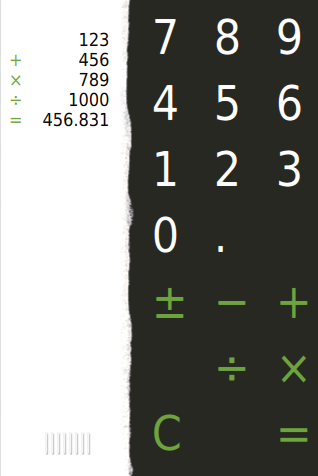 The clear (C) operator resets the calculator engine.